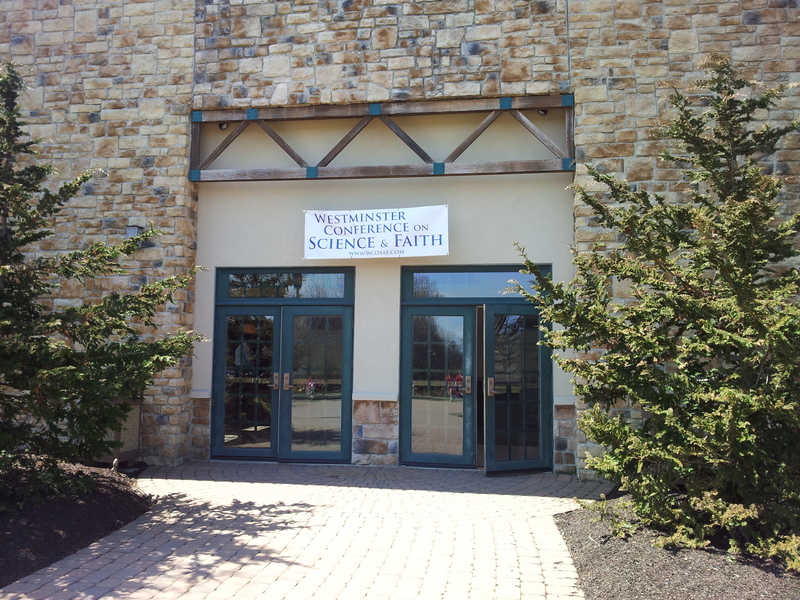 Last weekend (April 5-6) I attended the Westminster Conference on Science and Faith in Glen Mills, Pa. It was a real treat listening to a team of outstanding scientists speak on the theme, “How Did it All Begin,” and discuss the apparent controversies between science and faith. 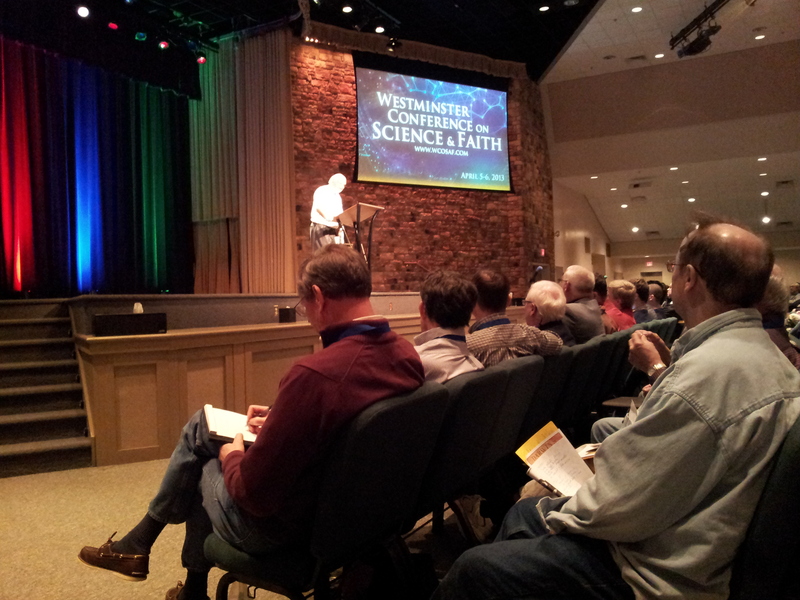 The speakers were solid, and made compelling arguments in favor of biological design, arguments against evolution, and appealed to scripture. The list of speakers I personally heard included Dr. Vern Poythress (Westminster Theologian and author of “Redeeming Science”), Dr. Doug Axe (molecular biologist, co-author of “Science and Human Origins, and Director of the Biologic Institute), Dr. John Lennox (Professor of Mathematics at Oxford University and author of “God and Stephen Hawking”), Dr. Stephen Meyer (Philosopher of Science Cambridge University and author of “Signature in the Cell”), and Dr. Paul Nelson (philosopher of biology and evolutionary theory). Needless to say I was very impressed with every one of them, and I’m looking forward to delving into and researching more of their work. There were a few other speakers for the “breakout” sessions I wasn’t able to attend, and I hope to hear them soon as well. Dr. Vern Poythress led off the event on the topic, “Why the Beginning is Important and Why People Fight about It”. To answer that question he says that there must be a God, or a god substitute (science, atheism, evolutionism, etc.). Such a dichotomy means there will inevitably be conflict between the two sides. Other points he addressed were Reductionism (the attempt to break down complex things into simple, fundamental parts) and scientism (the scientific position is the only one that counts). These philosophies seek to exclude God and Christianity and lead to a “slight-of-hand”, not allowing for a full understanding of biology. Understanding how a biological system works, for example, doesn’t tell us how that system came to be. Scientism maintains that reason is an illusion because it’s just a chemical process; reason, its adherents believe, undermines science. It also claims that materialism is all there is (just matter and motion). Dr. Poythress claims these beliefs leave no foundation for science because we can and do use reason and can identify right from wrong. In fact God gives rationale to science and even specifies the laws we end up using to understand science. Science, therefore, has drifted away from its founding. Materialism assumes gradualism by unguided forces. He points out, however, that false assumptions would skew the results and conclusions. Scientists have made up their mind before doing science typically and won’t consider any opposing views. Dr. Doug Axe, a chemical engineer and protein scientist, turned out to be my favorite speaker of the weekend. 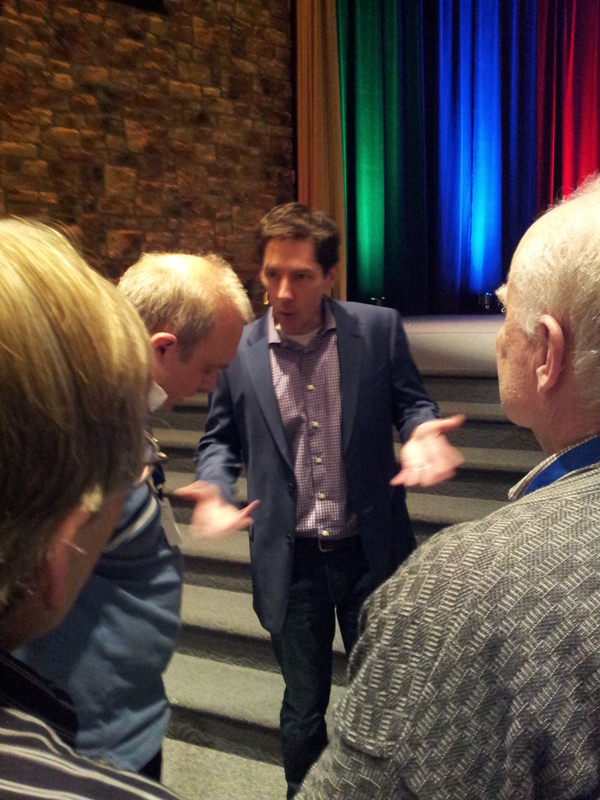 He was personable, did a nice job answering questions after the sessions, and made many excellent arguments. His main point was that molecular evolution does not work. The mechanisms, such as natural selection and mutations, fail. Experiments by Harold Urey and Stanley Miller in 1953 were expected to solve the origin of life question by the year 2000, but that prediction never materialized. The experiments produced brown goo and inorganic molecules. Dr. Axe claims that belief in evolution has inhibited science, and gave examples that have been largely ignored, such as the giraffe neck, the eye and wing- all of which pose problems for evolutionists. He pointed out that Darwin’s “tree of life” is wrong and misleading because there are dead-ends and imaginary organisms created to fill the gaps. Story telling is one of the many problems of evolution. Dr. Axe says that similarity plus evolutionary story telling does not equal a scientific explanation, but that’s what evolutionists resort to. Dr. John Lennox spoke with a good sense of humor and discussed origins, naturalism vs. theism, and examined the claims of Stephen Hawking and Richard Dawkins. He rightly claims that science is not at war with religion; the war is between our worldviews. Science, in fact, is comfortable with a belief in God. Atheism, on the other hand, seeks to marginalize Christianity. It was a Christian worldview that gave birth to science. In fact the first scientists- such as Francis Bacon and Isaac Newton- believed in a law-giver. Christianity, Lennox states, is an evidence based faith, and God is the God of the whole show, not a god of the gaps. He demonstrated the absurdity of one of Stephen Hawking’s questions, “who created God”? Lennox explained that this question assumes that God has been created- but if God wasn’t created, then it doesn’t apply. Hawking claims that the idea that the universe is fine tuned is an “old” idea. But Lennox responds, asking, is that idea “true”? Grand design, he maintains, is evident in biology and nature. In fact perception of design is obvious, which is why Hawking, Dawkins and other atheists spend so much time trying to refute it. According to Hawking, the law of gravity tells us that the universe can and will create itself out of nothing. But Lennox points out that a quantum vacuum is not “nothing”. Hawking claims we must choose between God and science, but this is a “category mistake”, confusing two levels of explanation. Belief in God is more rational on many levels. Lennox, in his final session, claims that the cultural battle is for the heart and mind, and we need to be informed and equipped if we’re to have success. In closing he said that information is not material, and that humans are capable of reason. Christianity, therefore, gives science reason. In another session Doug Axe discussed his experiments demonstrating the limits of adaptability, which means there’s simply not enough time for life to evolve if we even considered it seriously. He calls such belief “ludicrously implausible”. Many systems in biology have a causal circularity, meaning that a certain system is needed to make itself. For example the amino acid cysteine is needed to make cysteine, so there’s no way for it to create itself in a biological system. Such bio complexity has been peer reviewed in technical journals. Lastly he spoke out against the undeniable prejudice in peer reviewed technical journals that he himself has experienced when others discovered he supported Intelligent Design. This means he’s had to find other venues to publish his work. In his talk Dr. Stephen Meyer explained that the origin of life is at an impass; it hasn’t made any progress and still remains a mystery to evolutionists. Prebiotic natural selection hasn’t demonstrated an undirected chemical process that can produce the information needed to generate life in the first place. He went on to address the principles of geology formed by Charles Lyell, which uses known causes to explain existing phenomenon. But in life there are no known self-organizational forces to explain past causes. I like one of the quotes he used from Henry Quastler: the “creation of new information is habitually associated with conscious activity.” The obvious conclusion is that a designer and creator is necessary for living organisms to exist. Dr. Paul Nelson’s talk was on Neodarwinism and how it doesn’t account for the animal form and its development. This was the fifth year the Discovery Institute has sponsored a conference on science and faith, and I’ll be interested in returning next year. In fact I’d highly recommend attending next year’s conference if you’re interested in such topics. Previous year’s conferences are also available, and soon this year’s conference will also be made available.